As a professional carpet cleaner in Tampa FL I deal with cat urine stains in carpet on a daily basis. Whether it's visible to the naked eye or is only identified by the terrible ammonia smell it off gases. Cat urine is one of the most difficult stains to deal with. I tell my Tampa FL customers that the best way to deal with cat urine in the carpet is to clean it it up quickly. The longer it sits in the carpet the more it will smell and be more difficult to get out. So how do you get cat urine smell out of carpet? First, clean it up while it's still wet. The second part is to use water only as your cleaning agent. Don't use vinegar or baking soda or any other additives. They can help set the urine stain in the carpet. Just use water, and lots of it. When my pets urinate in the carpet I use a terry cloth towel to blot out as much of the urine as possible. Then I grab a half gallon container and fill it with water. I quickly soak the spot with twice as much water as there is urine, so a lot of water. Then wait about 30 seconds. Take a new clean towel and start to bolt up the water. keep using a new dry spot on the towel to get as much of the water up as possible. Then take another towel and place it over the wet spot and stand on it to get he rest of the urine out. If you have a wet/dry vacuum or a carpet spot machine you can use that to extract the water. Just get it as dry as possible so that there is only a small amount of diluted urine in the carpet. This is how I get cat urine smell out of the carpet. It works every time. 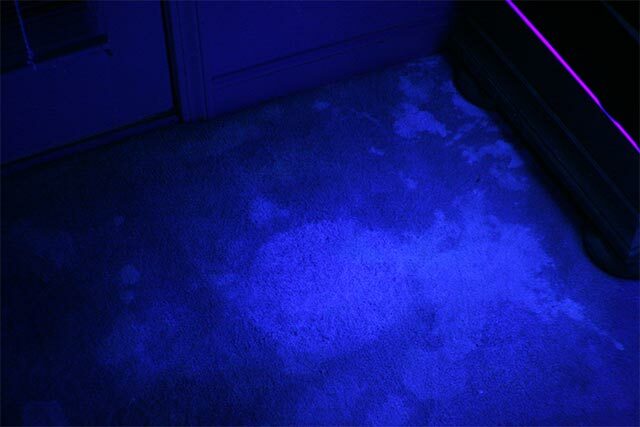 If there is a lot of urine and it has been in t he carpet for a few days it's time to call a professional carpet cleaner. To get pet urine smell out of carpet call Chem-Dry of Tampa.